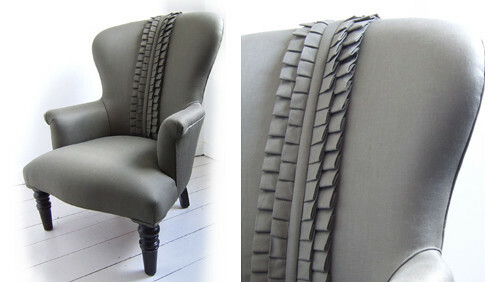 A sweet little gray chair with pintucked ruffles running down the middle. Super pretty. I love the way the ruffles feel modern in gray and not all granny. Hmm what else could we add ruffles too? Check out more at aiveendaly.com. You're so right about the gray and the ruffles being a good match. I am tempted to make something gray with ruffles or pleats now! Thanks for sharing this, Katy! I think I would be afraid to sit in this but it is gorgeous! I absolutely love this chair. I wonder if over time it wouldn't look so great. Love love love it. Mmmmm. Gray + ruffles = happy me.